Well, the Halloween has gone now, and it’s time to redecorate the look of your house with the next upcoming occasion of the Fall, the Thanksgiving. Everyone is excitedly waiting for this exhilarating holiday with one must-do thing to welcome the day which is decorating the house. It’s always a fun project to give our home a seasonal decor which is so beneficial both for us as the homeowner and the guest. 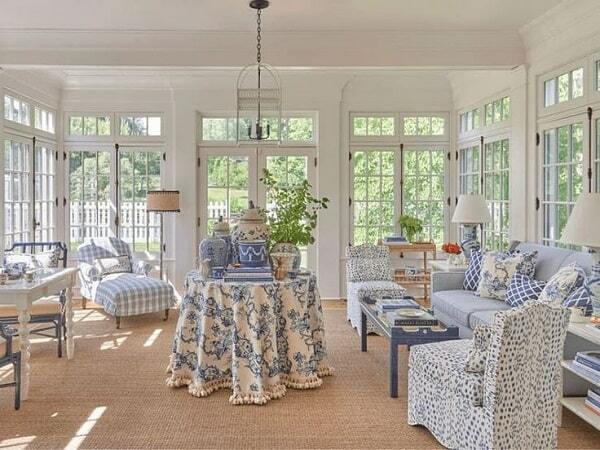 We can feel the fresh atmosphere that will make us love to spend time around our home, and, of course, impress the guests. For Thanksgiving – which still relates to the gorgeousness of the Fall – the decor is all about how to make the home look and feel warm. Then, it’s mostly all about nature, you will deal with leaves, flowers, pumpkins, and much more. 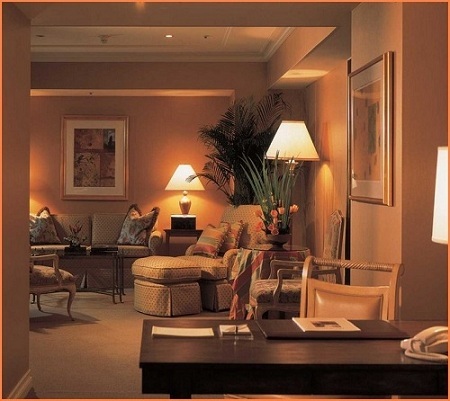 The living room is obviously the spot when all the family members and the guests have some fun times together. 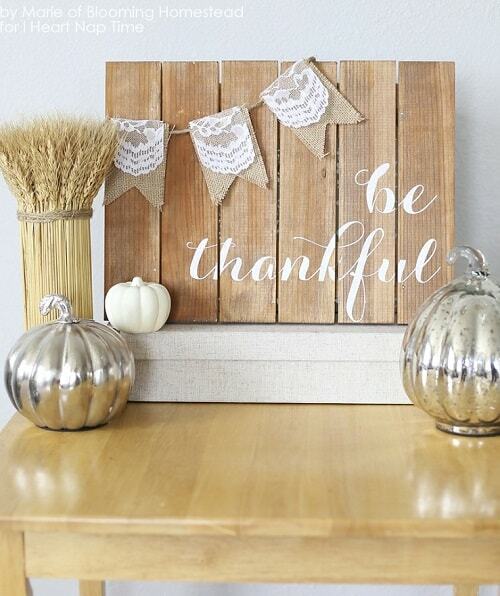 Therefore, decorating the room as adorable as possible is necessary to welcome this Thanksgiving day. 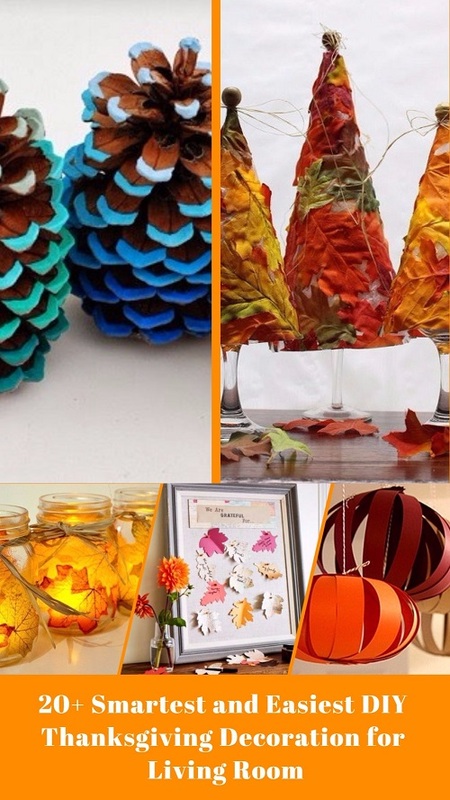 Here, we have some mesmerizing DIY Thanksgiving decoration for living room that are surprisingly easy to make at home at a very cheap cost. 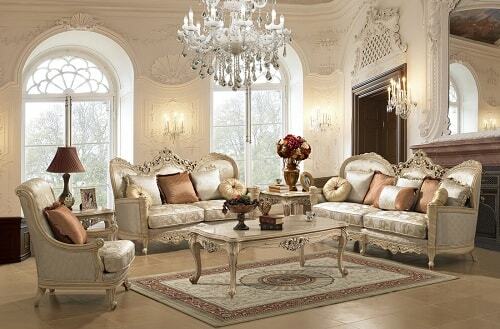 They will enhance the beauty of your living room superbly in no time. Let’s check them out below and get ready to be inspired! Yup, Thanksgiving is about thanking for the blessing that we got from the preceding year, and placing this beautiful Thanking Board is a very great idea. 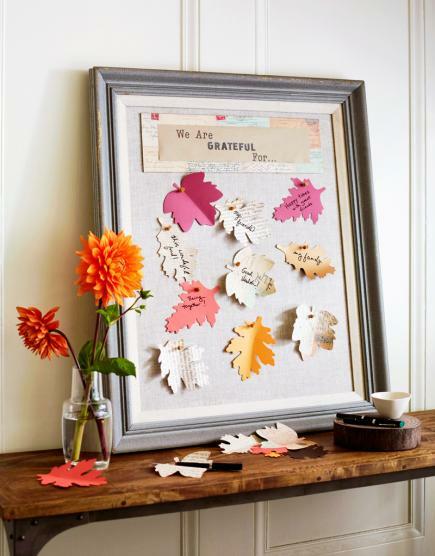 You’ll need an old used frame, cover a foam board with a white fabric, and make leaf-shaped paper from some colorful papers. Let the coming family members and guests write what they are thankful for this year. 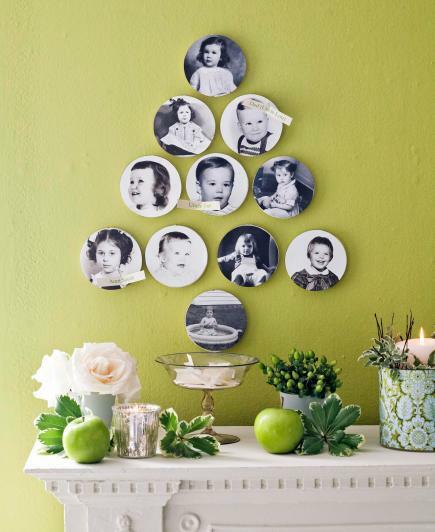 Such an entertaining decor that you have to try. Not only applicable to the front door, the wreath is always a nice decor to beautify the major wall of your living room too. 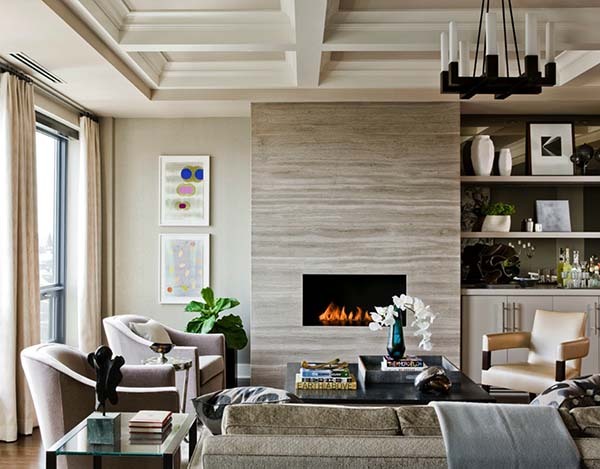 Moreover, it also can be a focal point of the overall wall decor of the room. 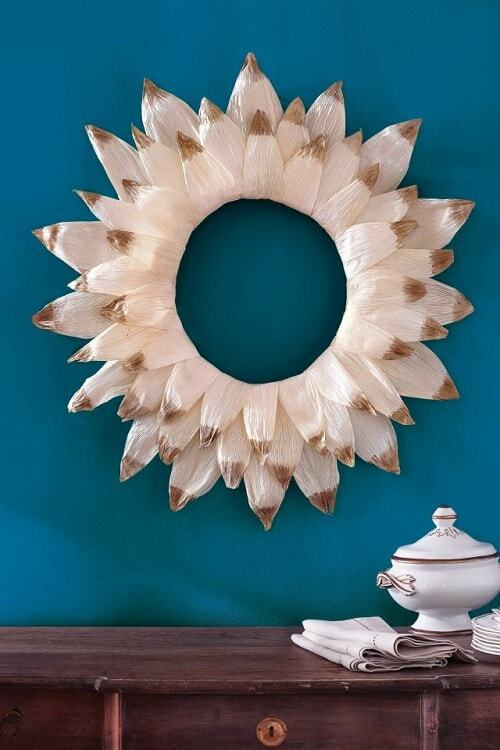 Here, the corn husks are made into a gorgeous wreath that surely fits the theme of the Thanksgiving day. The materials include the straw wreath, corn husks, and gold craft paint which will cost you for only about $26. 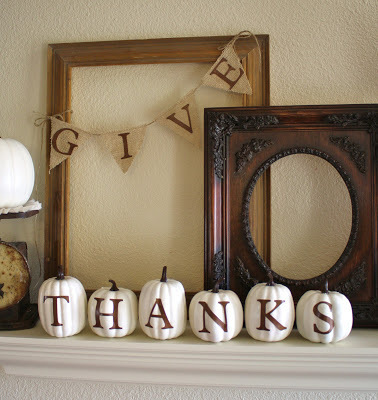 A super easy yet unique Thanksgiving decoration that will be nice to put on top of the fireplace. The fun part is this one almost costs you nothing. Go grab some small Maple leaves, dry them up, draw a pattern on the wood board, and stick the leaves using the mod podge. 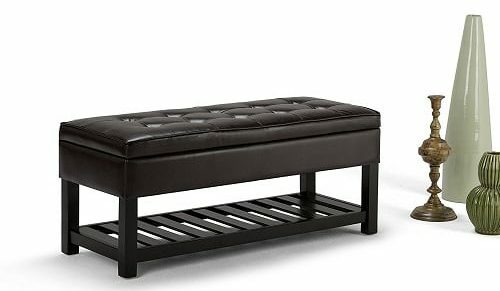 Easy, affordable, and beautiful. 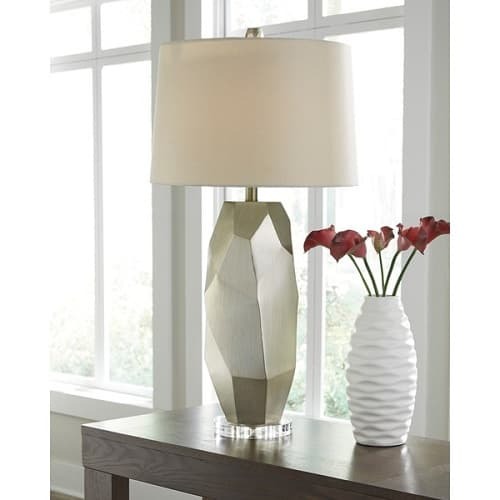 This is a very mesmerizing decor that will give quite a distinctive look to your living room this Thanksgiving. 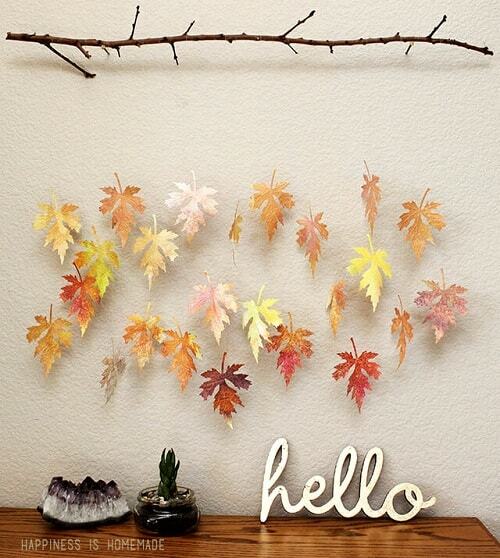 The leaves are made of the papers and you just need to hang them on the branch that you can find in your backyard. The look is totally beautiful, and the making process is very easy to do. 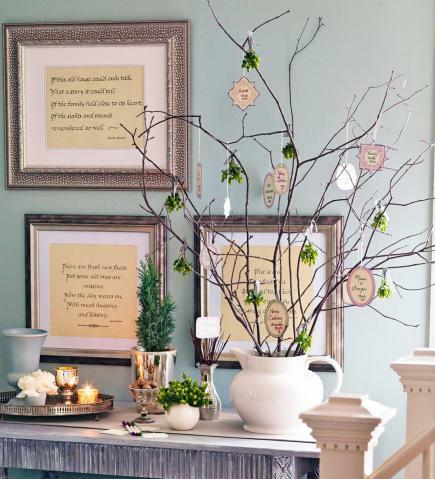 Guess how this beautiful Thanksgiving decoration for living room is made of? Well, you just need to prepare some wax papers, faux maple leaves, and wine glasses. 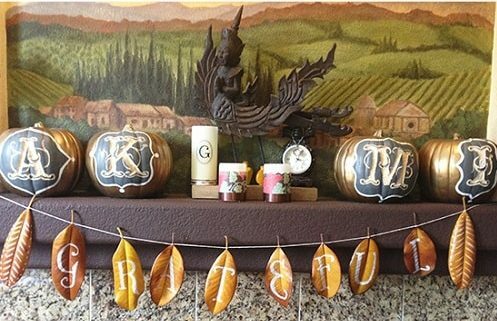 But the fun doesn’t stop there, you can also insert some battery-operated tea lights and this decor will lighten up your Thanksgiving evening beautifully. 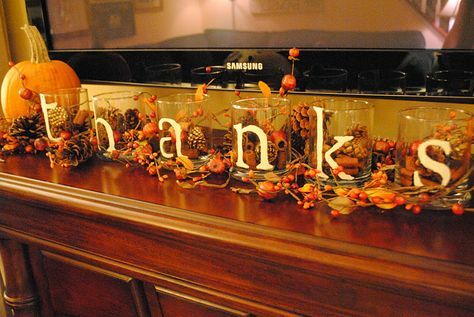 A nice Thanksgiving decoration for living room to add another style to your rustic TV console. It looks so warm with its natural style. You’ll need some sticker letters, transparent glasses or jars, pine cones, acorns, and some natural stuff. A beautiful small thing that will be a unique addition to decorate your fireplace or side table of your living room. The steps involve sticking the faux leaves onto the ballon’s surface, pop the balloon then remove it. The bowl will be a nice holder for the battery-operated tea light or other dazzling things. 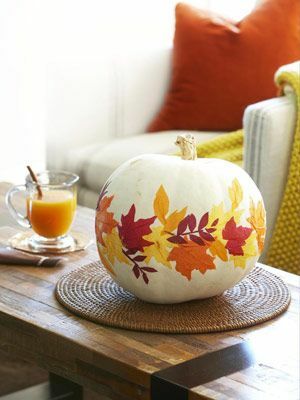 This one is an effortless Thanksgiving decoration for living room to enhance the beauty of your side table. As you may have noticed, this decor is only made of the used root beer bottles and letter stickers. Place the wheat inside the bottle, and it’s ready to go! The dazzling decor that is made of the mason jars and battery-operated tea light. 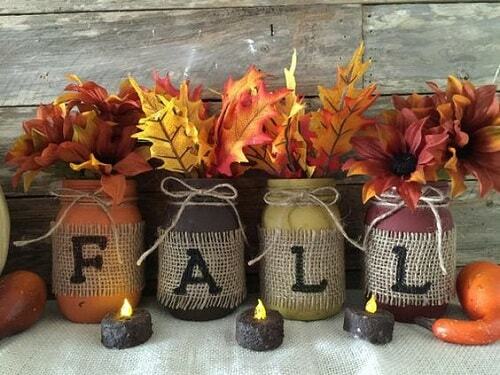 Then, the leaves make the jar look way more beautiful, and of course, fit the fall theme. 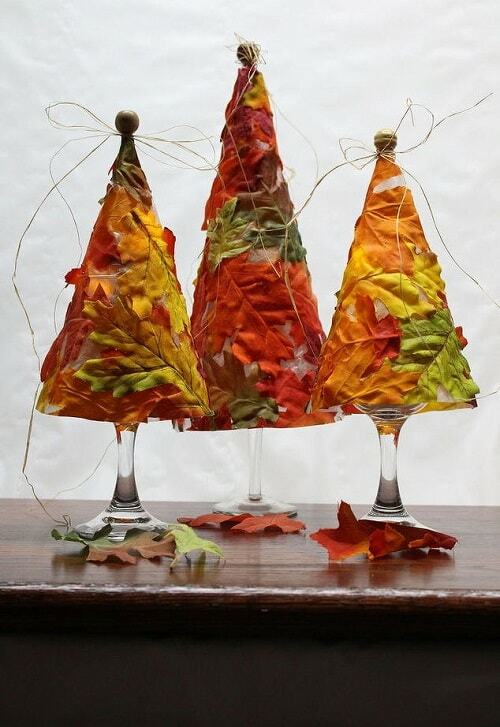 Another beautiful Thanksgiving decoration for living room that is made of the used bottle. 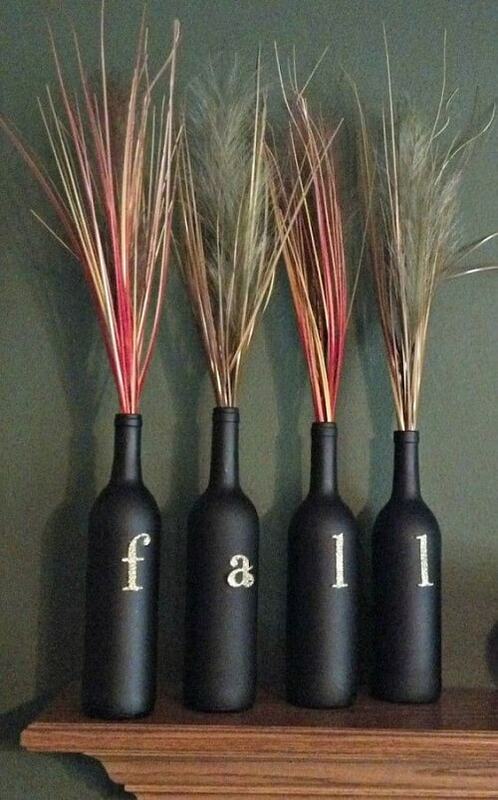 You can make this elegant decor by using some used wine bottles which are finished with the black chalk paint. 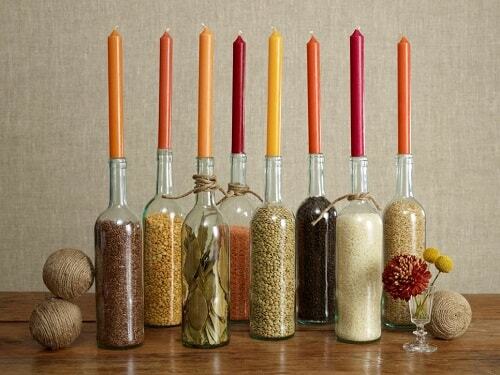 The wheat is also finished with the colorful looks that bring the bottles into a whole new style. The gorgeous no-carving pumpkin that will give a fresh dazzling touch to your living room decor. Go grab some tissue papers, cut them, and stick them into a white pumpkin! You may have seen this kind of decor a lot, but this one is quite unique since the pitcher is used as the pot. The look becomes more adorable, and you can try it with your own pitcher. A unique family tree that will be a fun spot when all the family members gather around in your living room in this Thanksgiving. You just need to print some baby photos of all the family members in BW and cut them around. 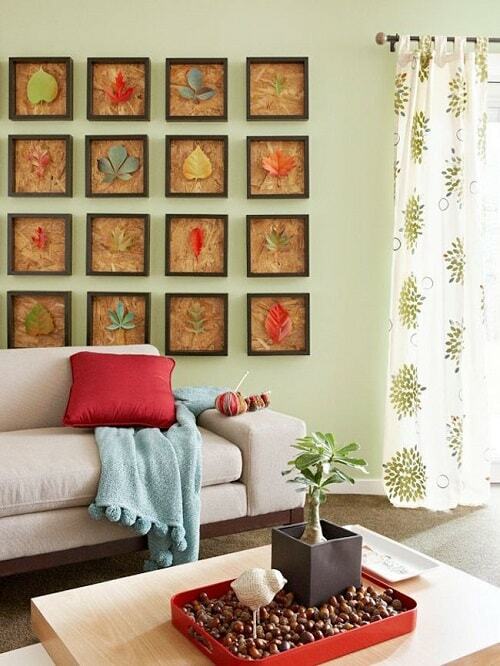 Then, you can arrange them on your living room wall. The cute banner to decorate the fireplace area which is made of some dry leaves. You can write and draw anything you want by using the markers. 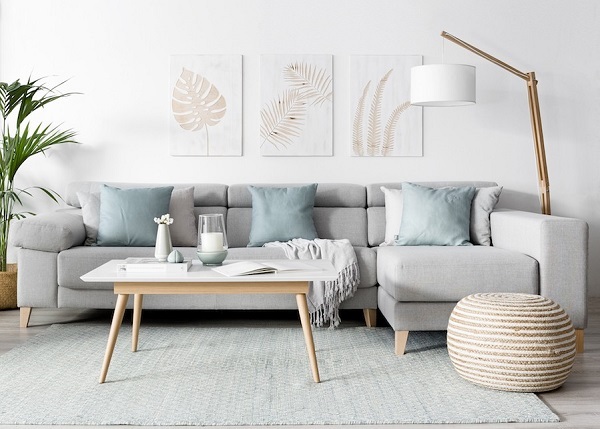 This one will make your living room wall look absolutely attractive. The huge dry leaves in various colors, then each one is glued on top of the wood board with the black frame. 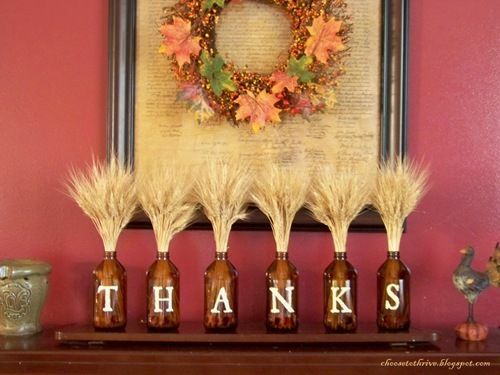 Cute bottles with “Give Thanks” pattern that will fit the theme of Fall very well. 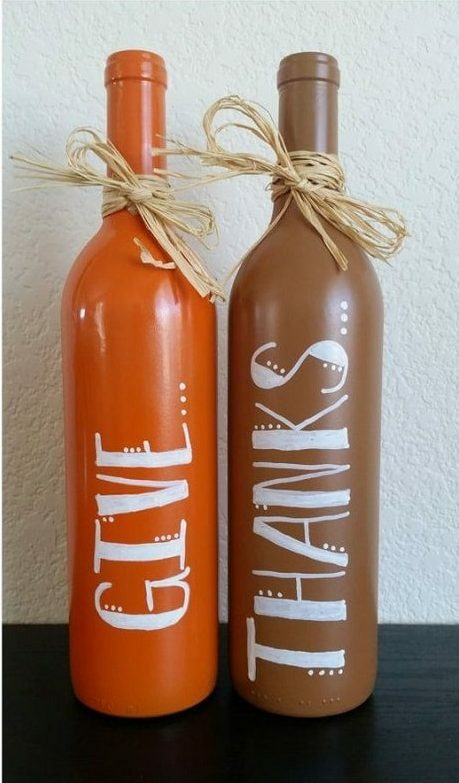 You can simply make it by just painting the bottles with orange and brown craft paint, tie a hay bow, and write your own saying. The mesmerizing pots made of the mason jars that have been finished with the chalk paint. 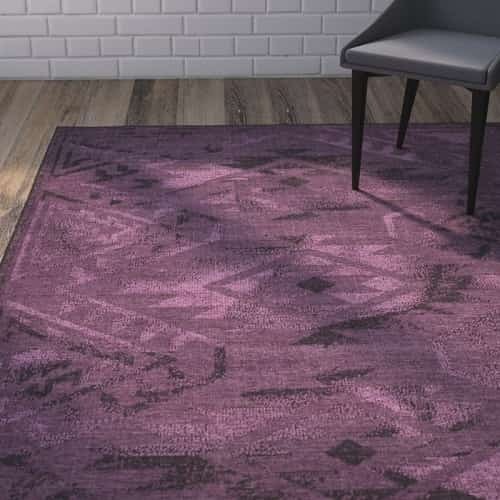 Moreover, the dry leaves and flowers are also finished with the maroon, orange, yellow and purple to give a more beautiful Fall look. Yes, the bottle is a thing of this year’s Thanksgiving decoration for living room. Here, they are made into some gorgeous candle holders. Go grab some clear glass bottles, fill them with dry leaves, corns, rice in various colors or other natural things that relate to the Thanksgiving. 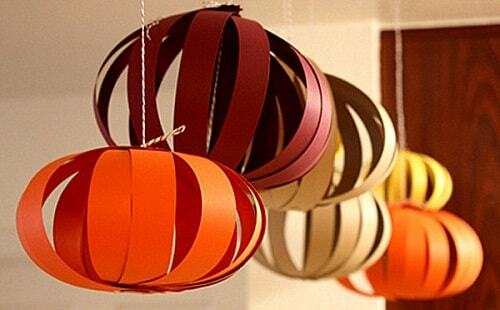 If you think that plastic or even real pumpkin look too boring, then this easy paper pumpkin is a very great option to try. It will be a unique hanging decoration to put in your living room for sure. The beautiful wall decoration that you can hang in your living room. It’s made of the wood strips, white paint, jute, and some burlaps to give a nice accent. Go find an old frame, and hang a cute banner on it. 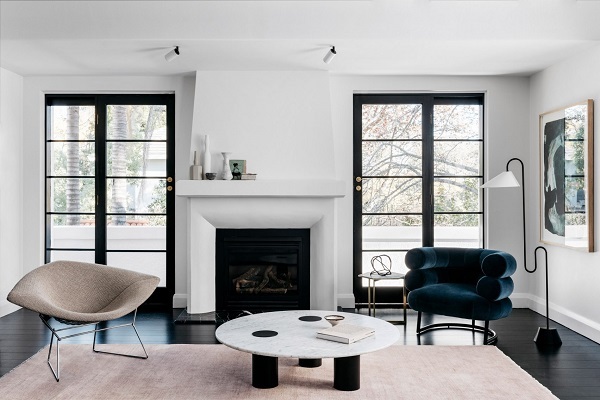 As the result, it looks simple yet so gorgeous to give such a unique accent to your fireplace in living room. 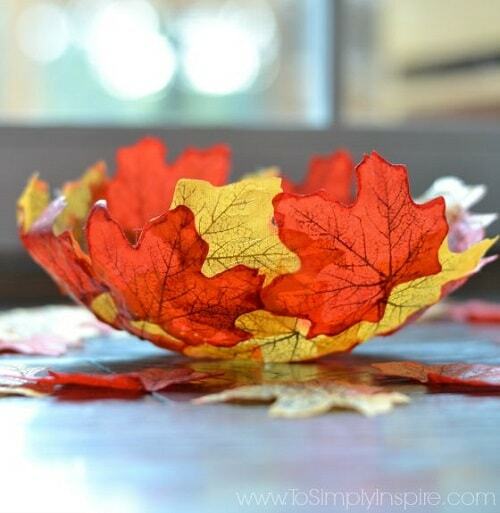 The cheap yet super cute Thanksgiving decoration for living room that is made of small pots, paper, and flannel. Furthermore, the fun thing is you can write the name of the family members that stay in your own home. Then, you can place the hats on the fireplace next to those small candles. 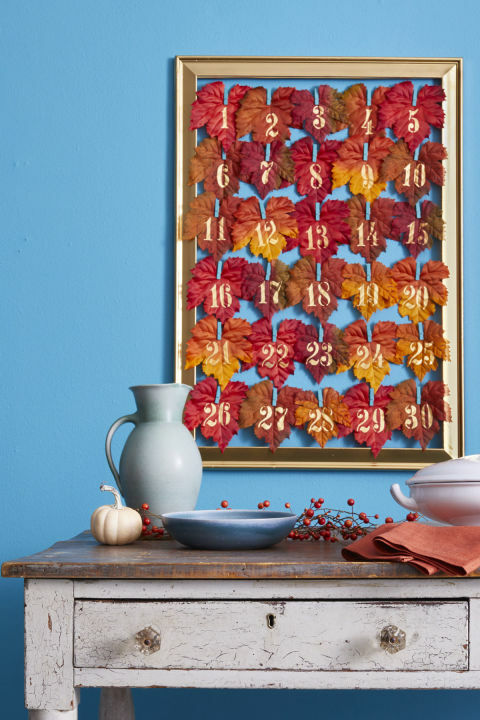 This is a super adorable calendar design that you can try to make to decorate your living room this Fall. 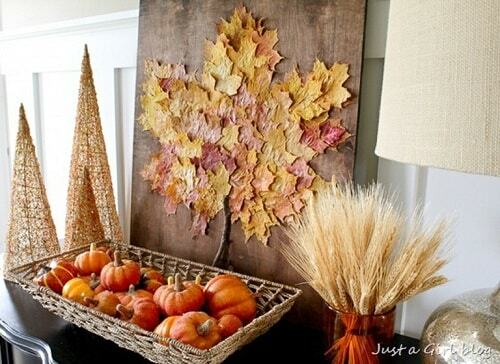 Just buy some faux Maple leaves, twine, and marker. Then, for the frame, you can use the old one, then paint it with the gold or brown finish. 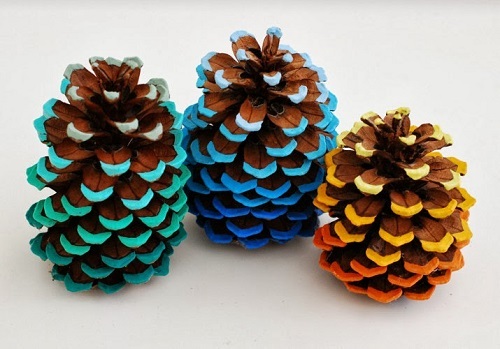 A piece-of-cake Thanksgiving decoration for living room with some pinecones as the materials. Then, give a little bit of bright acrylic paint on its edge. 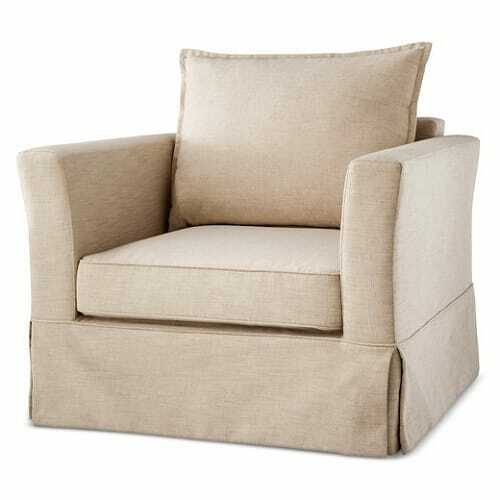 Hence, they will be a cute and bright decor to enhance the beauty of your living room. 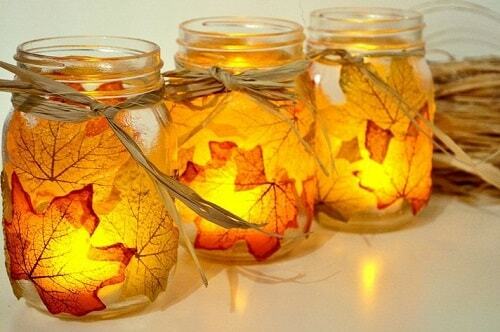 Eventually, those are some smartest and easiest DIY Thanksgiving decoration for living room that you can try at home. Also, those are very simple to make and also doesn’t cost you a lot. Moreover, you can find some materials in the Dollar Store or even get them for free since some of the decors use the natural or used stuff. 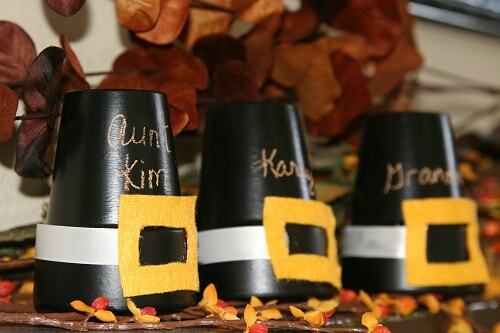 Then, choose the one that matches the theme of the Thanksgiving decor that you prefer. 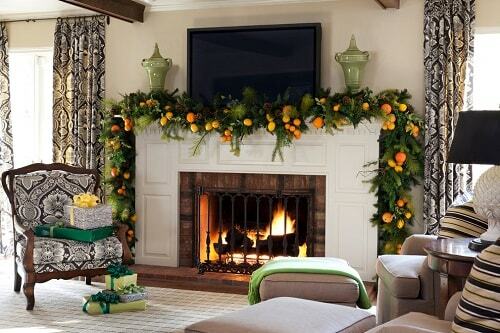 Finally, happy decorating your living room and have a fun Thanksgiving!